About 3500 BC, at the start of the Neolithic Age, a new lifestyle began to emerge. While hunting and gathering were still carried out to some extent the people had begun to control their environment and had become farmers. This farming way of life meant the establishment of more permanent settlements. Excavations have shown that Neolithic houses were large substantial structures built of wood with solid or wattle walls. The planting of food crops and the domestication of animals meant that Neolithic man had more time for leisure and cultural activities. This was reflected in the building of the many megalithic tombs which are found in all parts of Ireland. There are four main types of megalithic tombs: passage tombs, portal tombs, court tombs and wedge tombs. The first three types were built throughout the Neolithic Age with the fourth type appearing near the end of the period. Most passage tombs are found in groups known as cemeteries but there are some solitary tombs. Portal tombs are solitary structures found in most parts of Ireland except the extreme south west. Almost all of the court tombs are found in the northern half of the island. Wedge tombs are found in almost all counties of Ireland but are particularly common in the west and south west. Some of the passage tombs, particularly those in County Meath, have richly decorated stones. It is not clear whether this change to a farming lifestyle was a gradual progression among the natives or if it was a sudden change prompted by invasion from abroad. The local appearance of passage grave art in the Boyne Valley has suggested to some scholars that it was due to migration from the continent. Megalithic tombs with decorated stones are found in several places in Europe including Iberia. 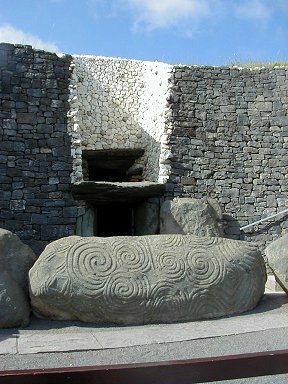 The alignment of many tombs, particularly Newgrange, Knowth and Dowth shows that Neolithic man had some knowledge of astronomy, or at least that he knew how to mark the seasons.